THE FOLLOWING ARTICLE about the making of one of Hollywood's first climbing films originally appeared in the 1975/1976 edition of Ascent. It is republished here as part of our celebration of Ascent’s 50th anniversary. Founded in 1967 by the Yosemite pioneers Allen Steck and Steve Roper and now published by Rock and Ice, Ascent is the compendium of climbing’s timeless stories. What’s it all about? Where do you lose that youthful dream, that idealism? Perhaps I’ll know by the time I reach the end. How long it seems since I read that. In this era of climbing commercialism, it is a little difficult to retain any integrity. The lure of glistening, distant peaks has been replaced by the lure of gold and silver, and it seems as if no climber can resist. Now Hollywood is in the arena, with the resources to make a Judas of any of us. For seven weeks during the summer of 1974 I worked on the filming of “The Eiger Sanction.” It was a miserable time. It is over now and I am glad. But the summer lives on in more than memories, and that is what this ... (confession?) is all about. For most of us mountaineers working on the film, it was our “Fistful of Dollars.” To one who lived on pea soup and porridge in a shepherd’s hut, it was a home for his wife and child. To another it was a log cabin in Wyoming, and to another it was the break into a new life as a professional mountaineer. For me it was my temptation, my 30 days in the wilderness. I had qualms about accepting the job. The smiling face of Toni Kurz, and the struggles of Heckmair and the rest were my boyhood treasures; “The White Spider” was my Homerian epic. ﻿The crux of filming was the Big Fall where everyone dies but Eastwood, and his subsequent rescue a la Toni Kurz. Masterminded by Hamish MacInnes, the famed Scottish mountaineer and "Fox of Glencoe," the scene was shot on the Eiger North Face itself. Winched by chopper into a tiny eyrie overlooking the Rote Fluh on the Eiger’s North Face, we rigged an alloy ladder out into space. We then dropped three kapock-stuffed climbers from the ladder, to freefall some 1,000 feet, hoping first unit’s camera was running in the meadows below the wall. Then it was Eastwood’s turn. No wonder he looks gripped. 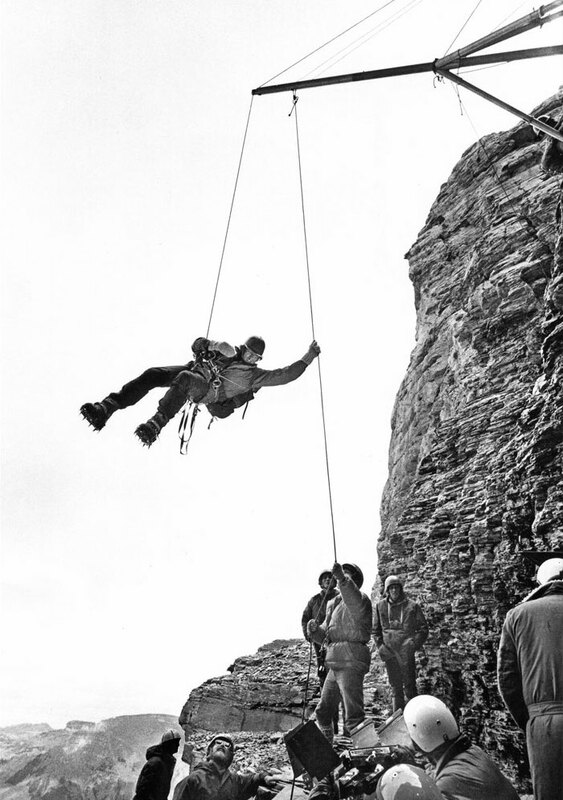 Haston re-checked the ropes and knots and Eastwood tightened his Whillans harness around his crotch before swinging out to the ladder’s end and lowering some 20 feet into space. Juggling greed and idealism, and scared silly of what I might have to do, I made my annual flight east. Two pleasant days were spent scouting the face and rigging. “That scene on the Shattered Pillar would be terrific, and the cameraman could film from the 3.8 km window. The Rote Fluh is steep, too steep for actors, but it’s safe.” I learned a lot and made a fine acquaintance with the mountain. On the third day we started shooting. My first task was a 25-foot leap into space and I balked. A somewhat dramatic scene in the brass-and-leather Scheidegg Hotel bar the night before, and my cover was blown. I spoke my piece. No falls! But, of course, there were others more anxious than I that the show go on, and the gap was filled. 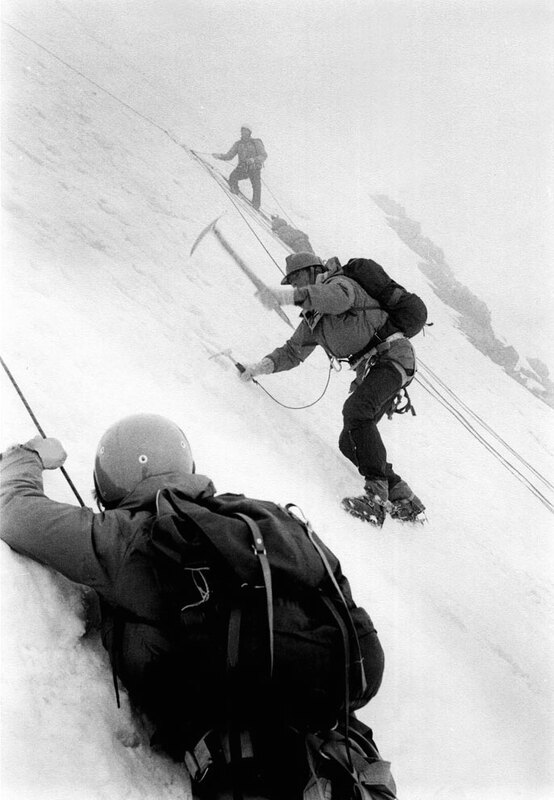 ﻿Swept by stone fall, the ice fields on the Eigerwand are not places to hang around, and the second-unit director, Norman Dyhrenfurth, from previous experience, pointed us at the perfectly safe north face of the Mathildaspitz, a small peaklet adjacent to the easily accessible Jungfraujoch just west of the Eiger, to which we could ride the train. Here we shot the ice-field sequences. As is obvious, Eastwood was no ice climber and is merely changing position—he was filmed only in static close-up while all movement takes were doubled by the elegantly moving Martin Boysen or myself. Luckily throughout the shooting here, the incongruous distance of green hills was obscured by constant poor weather. Another point was raised that night—how many people would be killed by showing the wrong techniques and attitudes? I won few friends but made my point. That was the last official meeting, and our after-dinners were undisturbed in the future. I was relegated to other duties off camera. And so the film rolled. Two days later, at nightfall, we flew to a cliff high on the Eiger’s west ridge. The body of one of the team hung jackknifed in space, suspended from the anchor rope. My mind could barely register, for it was all too real. There was nothing we could do. His dreams of a Scottish Highland cottage were forever gone. In climbing there are too many scenes that you can’t retake. We had spent two days rigging and shooting the most difficult part of the film: “Stonefall hits climber who is held on rope and then pulled onto ledge. Climber ultimately dies.” All had gone well and the final scene (plastic rocks being dropped from above) had been shot when a real rock did its job. Result: one dead real climber and one bruised cameraman. We all know one thing—climbing is very real and Hollywood is fantasy. You can’t forget that and stay alive. I had been standing beside my now-dead friend 20 minutes before it happened and, as I was no longer needed, excused myself and jumared to the waiting helicopter. It was the second-spookiest place I have ever been. They say that the show must go on and it did. After a few days grace and the miraculous appearance of a special $100,000 insurance policy, we were back at it—bivouac scenes, ice climbing, rock climbing, and day-for-night shots with knives flickering in the moonlight as they silently slit ropes (oh, sacred ropes). But the heights of absurdity and black humor had yet to be plumbed, and several days were spent doing the “body-hauling scene.” Bidet, the body, was not real and became a silent companion. The humor was that a rope continually oozed real blood on wet snow. No one ever considered replacing it. Finally we reached the “body-discovered scene.” The makeup man outdid himself and created a frozen, putrid, and mutilated corpse. We all remember Longhi, Sedlmayer and Mehringer and so, it seems, did the scriptwriter. Ironically, someone commented that the movie had lost all contact with reality. Finally, there was the dramatic leap, the three-thousander down the face—the ultimate peel. Even my California cousins balked at this, and so three dummies were enlisted. Footage from cameras thrown over the edge and from several dozen other falls should make a heart-stopping climax. There was some climbing for fillers. The Shattered Pillar was never touched, although it offered, to me, the finest camera angles for climbing. The actors did most of their paces themselves on an assortment of cliffs and boulders. Several more serious moves were recorded with stunt men in “doubling gear,” but they should not consume too much of the public’s time. So if that’s the film, then what of the people? A mixture and, surprisingly, a pleasant one. The First Assistant Director liked the mountains, hiked with his wife and took some pleasure in learning a little technical climbing. He was always helpful and a joy to be with. The Chief Cameraman made it 50 feet off the ground for the day-for-night shot and must have discovered more than camera angles. Perhaps it was the sunny weather, the meadows, the cowbells and the light on the Jungfrau, for that night he ecstatically thanked us for the finest day of his life. ﻿London, spring 1974. Phone rang. "Mr. Eastwood would like you to join him for lunch at Claridge’s." While not a movie buff, I was familiar with Eastwood’s name, and, intrigued, I accepted the invitation. Clint Eastwood seemed like a nice guy. He outlined his plans for the summer—shoot a Hollywood film, "The Eiger Sanction." 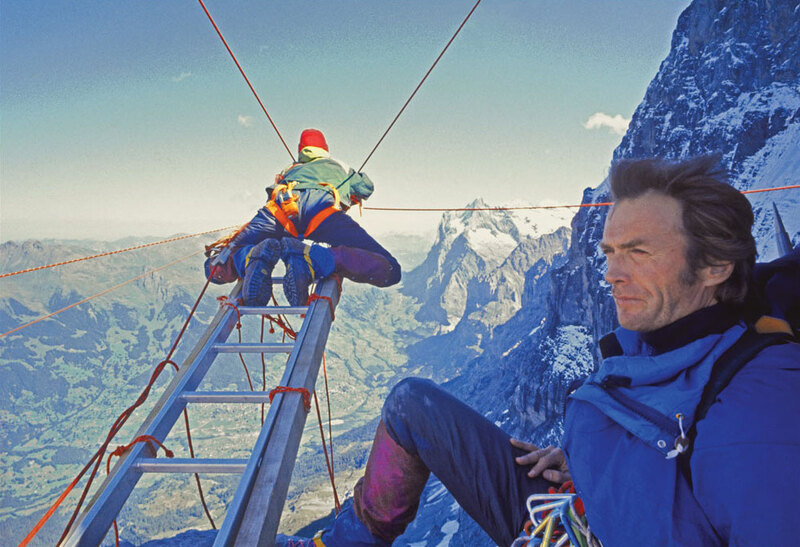 But unlike other climbing films that had been shot on sets of fake mountains, Eastwood’s production would be shot on the real Eiger. Eastwood, I thought, was crazy. But when he told me that he’d already signed up Dougal Haston and Norman Dyhrenfurth, two friends I respected, as safety officer and second-unit director, I thought, "Why not?" In this photo, Eastwood, playing the art collector/ assassin Dr. Jonathan Hemlock, dangles from a portable tripod about 2,000 feet up the Eiger North Face. George Kennedy could not leave Scheidegg soon enough, although he was always most personable. He knew that mountains were for mountaineers, and that he was an actor (a good one, the best in the group). Jean-Pierre Bernard had the roles straight and did a fine job for the cameras. He knew that climbing is for climbers, and every day on the mountain was a test for him. Anyway, who wants to play a cuckolded, middle-aged has-been who gets bonked on the head and then dragged all over the mountain? Michael Grimm showed the most climbing aptitude and has moved to Austria, where he hikes and skis with his family. Perhaps he is a little too weak on his lines, but climbers never were much for words. And Reiner, 6-foot-5 Reiner. Well, he lives every role he plays, so who knows? Finally, there’s Clint, .44 Magnum traded for an ice axe. Eastwood, like the character he played, was willing to take his chances with the Eiger. They both lived through it, but not because of their own doing. Perhaps the gods look out for those without consciences, but who try. He’s got a lot more nerve and energy than I have, but I would not trade places. Through it all, the parade of Eiger candidates passed by. Messner and Habeler made their astounding 10-hour ascent. Roskelley and Kopczynski came and went as most, unnoticed. I played on the fringes, vacillating between guilt and despair. In late September the mountain was left to itself, and the party went home. Who knows what will end up on the cutting-room floor and what will make the screen? It is unlikely, but there may be some taste shown in the editing. One thing is certain—this summer Eastwood will again be the North American idol, and the fellows who climbed the face for real will go unheralded. But perhaps that is the way it should be. And for the future, another film is being discussed. It will be on the life of Gary Hemming. Perhaps if the folks from Hollywood look closely enough into that life and themselves, they may realize why he blew his brains out. 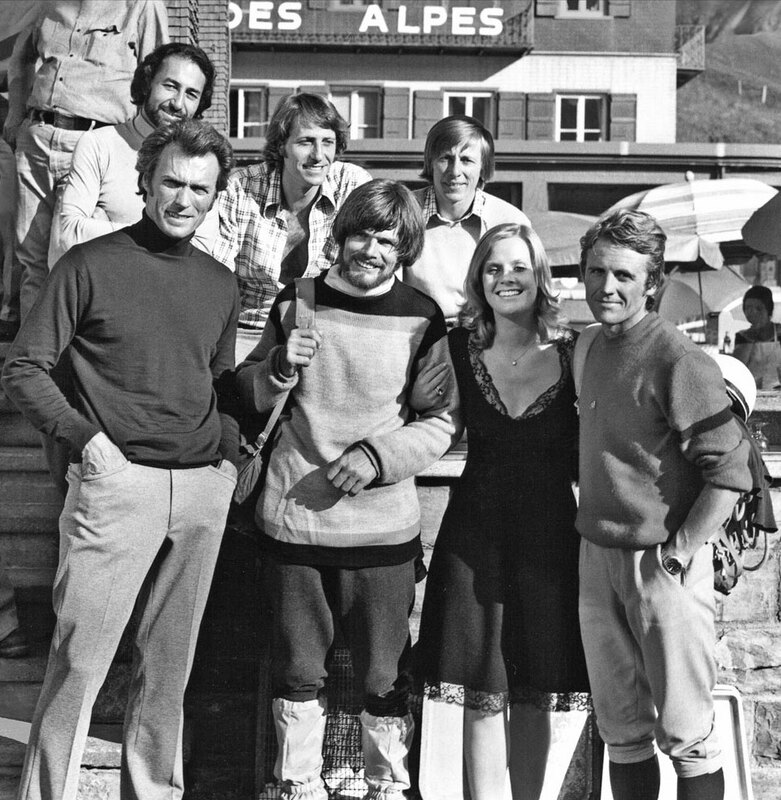 Photo, left to right: Eastwood, Reinhold Messner, Heidi Brühl (Mrs. Montaigne), Peter Habeler, Jean-Pierre Bernard (Montaigne), Reiner Schone (Freytag) and Michael Grimm (Meyer). "There comes a time in some movies when sheer spectacle overwhelms any consideration of plot, and Clint Eastwood's 'The Eiger Sanction' is a movie like that," wrote the movie critic Roger Ebert in 1975. Indeed, while the story was silly, the movie did well at the box office thanks to the efforts of the real climbers who provided the spectacular camera angles, took the risks and provided Eastwood with advice, which was usually implemented. While we were busy filming, Messner and Habeler zoomed up the 1938 Route in the then-record time of just 10 hours. They could hardly avoid passing our hotel at Kleine Scheidegg on the way down, and of course, they were well entertained. There was great camaraderie up there at Kleine Scheidegg; we all mucked in. The Hollywood boys were delighted to escape from the clutches of the film and actors' unions—all the bit parts were played by technicians or climbers, even by me. The first casualty occurred before we started filming, when the renowned first-unit cameraman, hardly an outdoor type, was rushed down to the hospital with ... surely not altitude sickness? And there he stayed for the duration, though the critics later applauded him for our work. There was a twist in my own tale when, after the filming wrapped, I tripped on a curb outside our Zurich hotel on the way to the airport and home, and tore a ligament in my knee. Ironically I was insured up to the point of stepping out of the hotel. I had to be wheelchaired to the airplane. After “The Eiger Sanction,” Chic Scott continued to climb and guide, notably in the Mount Logan region. In the early 1990s he began writing ski guidebooks, climbing and ski histories, and biographies. He has lectured extensively on mountain themes. John Cleare continued in photography, lectured around the world, edited a climbing magazine, published 40 books, and made dozens of expeditions on six continents.